Every user interface element with which users can interact is accessible. This includes elements that merely supply information, such as static text, as well as controls that perform actions. All accessible elements supply accurate and helpful information. In addition to these fundamentals, there are also a few things you can do to enhance a VoiceOver user’s experience with table views and to make sure dynamic elements in your application are always accessible. As mentioned in Accessibility and VoiceOver a user interface element is accessible if it reports itself as an accessibility element. Although being accessible is not enough to make a user interface element useful to VoiceOver users, it represents the first step in the process of making your application accessible. As stated in iOS Accessibility API and Tools, standard UIKit controls and views are automatically accessible. If you use only standard UIKit controls, you probably don’t have to do much additional work to make sure your application is accessible. In this case, your next step is to ensure that the default attribute information supplied by these controls makes sense in your application. To learn how to do this, see Supply Accurate and Helpful Attribute Information. If you create custom views that display information or with which users need to interact, you must ensure the accessibility of these views yourself. After you’ve done this, you need to make sure these views supply accessibility information that helps people use them (see Supply Accurate and Helpful Attribute Information). From the perspective of accessibility, a custom view is either an individual view or a container view. An individual view does not contain any other views that need to be accessible. For example, a custom subclass of UIControl that displays an icon and behaves like a button does not contain any other elements with which the user can interact, apart from the button itself. Read Make Custom Individual Views Accessible to learn how to make an individual view accessible. A container view, on the other hand, contains other elements with which users can interact. For example, in a custom subclass of UIView that performs its own drawing of geometric shapes, the shapes represent elements with which users can interact, and which are distinct from the container view. Such separate elements within a container view are not automatically accessible (because they are not subclasses of UIView) and do not provide any accessibility information. To learn how to make the contents of a container view accessible, read Make the Contents of Custom Container Views Accessible. Note: In both of these code snippets, you can see comments in place of the code needed to set accessibility attributes. For more complete code snippets that show how to do this, see Defining Custom Attribute Information Programmatically. If your application displays a custom view that contains other elements with which users interact, you need to make the contained elements separately accessible. At the same time, you need to make sure that the container view itself is not accessible. The reason is that users interact with the contents of the container, not with the container itself. To accomplish this, your custom container view should implement the UIAccessibilityContainer protocol. This protocol defines methods that make the contained elements available in an array. The following code snippet shows the partial implementation of a custom container view. Note that this container view creates the array of accessible elements only when methods of the UIAccessibilityContainer protocol are called. As a result, if iPhone accessibility is not currently active, the array is not created. If you use custom views, you must supply all appropriate attribute information for them. For guidance, see Crafting Useful Labels and Hints, Guidelines for Creating Hints, and Identifying Appropriate Traits. Even if you use only standard UIKit controls and views, you might find that some of the default attribute information they supply could be enhanced to make more sense in the context of your application. For more information, see Enhancing Default Attribute Information. If you need to supply or change accessibility attributes on either standard or custom UI elements, you can do so either in Interface Builder (see Defining Custom Attribute Information in Interface Builder) or programmatically (see Defining Custom Attribute Information Programmatically). If you use a standard UIKit control or view that displays a system-provided icon or title, first make sure you’re using it in accordance with its intended purpose (see iOS Human Interface Guidelines for more information). Then, decide whether the default label attribute accurately conveys the result of using that control or view in your application. If not, consider providing a hint attribute. For example, if you place an Add button in your navigation bar by using the system-provided Add (+) icon in a UIBarButtonItem object, you get the default label attribute, Add, automatically. If it’s always obvious which item the user is adding when they activate this button, there’s no need to provide a hint attribute. But if there might be confusion, you should consider providing a custom hint that describes the result of using that control in your application, such as "Adds an account" or "Adds a comment." If you display a custom icon or image in a standard UIKit view, such as a UIButton object, you need to supply a custom label attribute that describes it. When VoiceOver users run your application, they rely on the descriptions VoiceOver speaks to understand what your application does and how to use it. Because these descriptions represent the bulk of the VoiceOver user’s experience with your application it’s essential that they be as accurate and helpful as possible. The guidelines in this section help you create labels and hints that will make your application easy and enjoyable for people with disabilities to use. The label attribute identifies the user interface element. Every accessible user interface element, standard and custom, must supply content for the label attribute. Note: A table row can also have a label attribute. However, the guidelines for creating a table row’s label differ from the guidelines for creating labels for other types of controls and views. See Enhance the Accessibility of Table Views to learn how to create useful labels for table rows. A good way to determine what a label should convey is to think about what a sighted user infers about your application just by looking at it. If you’ve designed a good user interface, sighted users should know what a control or view does in the current application context by reading its title or understanding its icon. This is the information you need to make available to VoiceOver users in the label attribute. Very briefly describes the element. Ideally, the label consists of a single word, such as Add, Play, Delete, Search, Favorites, or Volume. Does not include the type of the control or view. The type information is contained in the traits attribute of the element and should never be repeated in the label. For example, if you include the control type in the label of an Add button, VoiceOver users hear “Add button button” every time they access that control. This experience would quickly become annoying and might motivate users to stop using your application. Begins with a capitalized word. This helps VoiceOver read the label with the appropriate inflection. Does not end with a period. The label is not a sentence and therefore should not end with a period. Is localized. Be sure to make your application available to as wide an audience as possible by localizing all strings, including accessibility attribute strings. In general, VoiceOver speaks in the language that the user specifies in International settings. The hint attribute describes the results of performing an action on a control or view. You should provide a hint only when the results of an action are not obvious from the element’s label. For example, if you provide a Play button in your application, the context in which the button appears should make it easy for users to understand what happens when they tap it. However, if you allow users to play a song by tapping the song title in a list, you might want to provide a hint that describes this result. The reason is that the label of the list item describes the item itself (in this case, the song title), not what happens when a user taps it. Note: VoiceOver users can choose whether to hear available hints by selecting an option in VoiceOver settings on their device. Spoken hints are turned on by default. Very briefly describes the results. Even though few controls and views need hints, strive to make the hints you do need to provide as brief as possible. Doing so decreases the amount of time users must spend listening before they can use the element. That said, however, avoid sacrificing clarity and good grammar for brevity. For example, changing “Adds a city” to “Adds city” does not significantly decrease the length of the hint, but does make it sound awkward and a bit less clear. To help you find the right word, imagine that you’re describing the use of a control to a friend. You might say something like “Tapping this control plays the song.” Often, you can use the second phrase in such a sentence (in this case, “Plays the song”) as a hint. Begins with a capitalized word and ends with a period. Even though a hint is a phrase, not a sentence, ending the hint with a period helps VoiceOver speak it with the appropriate inflection. This is especially important because VoiceOver users can use VoiceOver-specific gestures to interact with elements in your application. If you name a different gesture in a hint, it would be very confusing. Is localized. As with accessibility labels, hints should be available in the user’s preferred language. The traits attribute contains one or more individual traits that, taken together, describe the behavior of an accessible user interface element. Because some individual traits can be combined to describe a single element, the element’s behavior can be precisely characterized. Note: Individual traits are combined using the OR operator. Outside of code examples, this document uses the shorter terms “combine” and “combination” without specifying the method of combination. A standard UIKit control, such as a button or text field, provides default content in the traits attribute. If you use only standard UIKit controls in your application (and do not customize their behavior in any way), you do not have to make any changes to the traits attribute of these controls. If you customize the behavior of a standard control, you might need to combine a new trait with the control’s default traits. If you create a custom control or view, you need to provide content for the element’s traits attribute. The UI Accessibility programming interface defines 12 individual traits, some of which can be combined. Some traits characterize an element by identifying its behavior with the behavior of a particular type of control (such as a button) or type of object (such as an image). Other traits characterize an element by describing a specific behavior the element can exhibit, such the ability to play sound. In general, traits that correspond to controls can successfully be combined with traits that describe behaviors. For example, you might combine the Button trait with the Plays Sound trait to characterize a custom control that behaves like a button and plays sound when it is tapped. For the most part, you should consider the traits that correspond to particular controls, specifically, the Button, Link, Search Field, and Keyboard Key traits, to be mutually exclusive. That is, you should not use more than one of these traits to characterize an element in your application. Instead, think about which one of these four traits corresponds most closely to the element in your application. Then, if your element has additional behaviors, you can combine the first trait with one of the behavioral traits. For example, suppose you display an image in your application that responds to a user’s tap by opening a link in Safari on iPhone. You could characterize this element by combining the Image and Link traits. Another example is a keyboard key that modifies other keyboard keys when it is tapped. You could characterize this element by combining the Keyboard Key and Selected traits. To see some examples of how traits characterize controls, you can use Accessibility Inspector to see the default traits that are set on the standard controls. 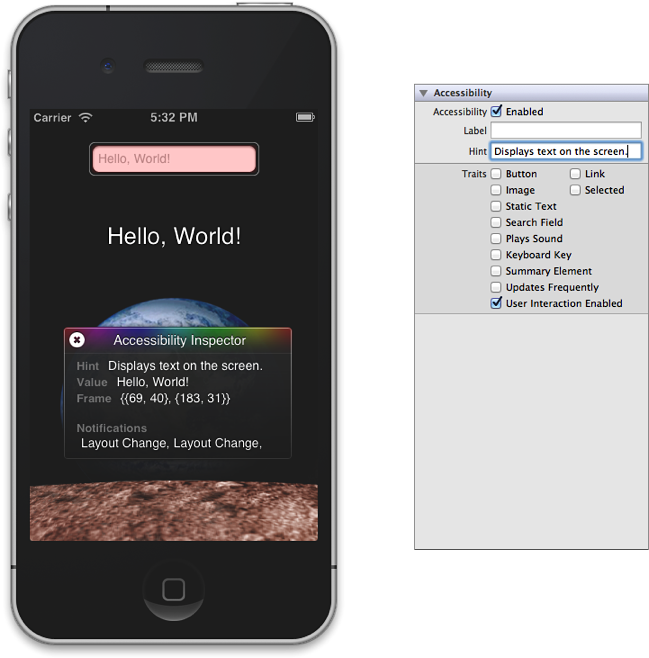 For information on how to use Accessibility Inspector, read Debug Accessibility in iOS Simulator with the Accessibility Inspector. When you install iOS SDK 3.0, you get a version of Interface Builder that includes features that help you make your application accessible. If your application contains standard UIKit controls and views, you might be able to do all your accessibility work in Interface Builder. If you prefer, you can supply custom information for attributes programmatically. You might want to do this if you’re not using Interface Builder at all or if you generate your views in code instead of using Interface Builder. As described in Make Custom Individual Views Accessible, you can set accessibility information in the implementation of your view subclass or in the code that instantiates the view. Both techniques are valid, but there is one reason why you might want to implement attribute methods in your subclass instead of setting attributes in the instantiation code: If your view displays data that is dynamic or that changes frequently, such as the time of day, you should implement the subclass methods to return fresh data as needed. For those situations, if you only set attributes when you instantiate the subclass, the returned data is likely to be out of date. The code snippets in this section build on those in Make Custom Individual Views Accessible, by including some of the attribute-specific methods. For example, if you want to implement accessibility methods in your subclass, you would write code similar to that in Listing 2-2. If you want to use the property-setting methods of the UIAccessibility protocol in the code that instantiates your custom view, you can write code similar to that in Listing 2-3. If your application displays a table view in which each cell contains items other than (or in addition to) text, there are a few things you can do to make it more accessible. Similarly, if your table view displays more than one piece of information per row, you can enhance a VoiceOver user’s experience by aggregating the information in a single, easy-to-understand label. Note: If your table cells contain any of the standard table-view elements, such as the disclosure indicator, detail disclosure button, or delete control, you do not have to do anything to make these elements accessible. If, however, your table cells include other types of controls, such as a switch or a slider, you need to make sure that these elements are appropriately accessible. Make each individual element accessible separately. Make sure the table cell itself is not accessible. Succinctly describe the overall contents of the cell and use this description for the label attribute of the cell. Note that, in this case, the label is considered to be one of the accessible elements within the cell. You’ve probably recognized that a table cell that contains multiple items, such as text and controls, fits the criteria of a container view, as defined by the UI Accessibility programming interface. However, you do not have to identify the cell as a container view or implement any of the methods of the UIAccessibilityContainer protocol, because the table cell is automatically designated as a container. If your table contains cells that provide information in discrete chunks, you should consider combining the information from these chunks in the label attribute. When you do this, VoiceOver users can get the meaning of the cell’s contents with one gesture, instead of having to access each piece of information separately. A good example of how this can work is in the built-in Stocks application. Instead of providing the company name, current stock price, and change in price as separate strings, Stocks combines this information in the label, which might sound like this: “Apple Inc., $432.39, up 1.3%." Notice the commas in this label. When you combine discrete pieces of information in this way, you can use commas to tell VoiceOver to pause briefly between phrases, making it easier for users to understand the information. If user interface elements can be in different states depending on other conditions in your application, you need to add logic to your code that returns the correct accessibility information for each state an element can be in. Because these changes can occur as the result of user actions, it’s best to add this logic to a subclass’s implementation, not to the code that instantiates the subclass. The following code shows how to handle dynamic state changes and how to send a notification when a screen layout changes. 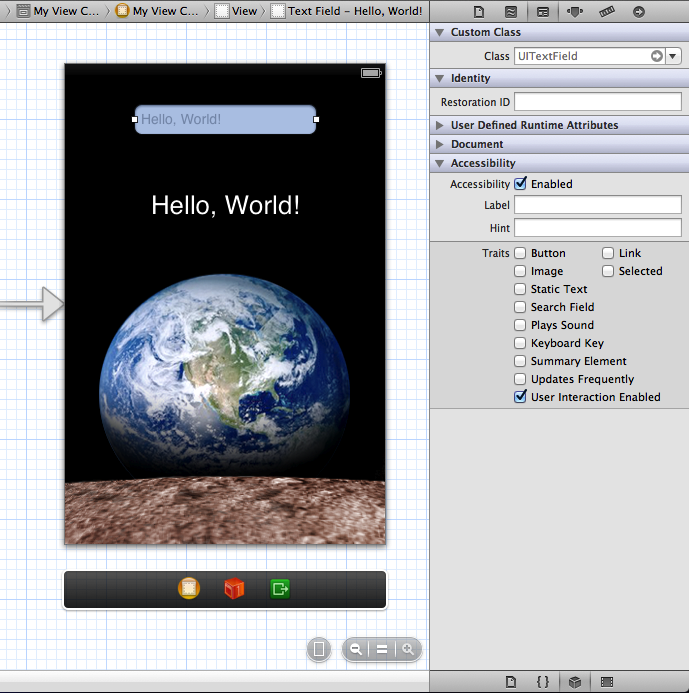 The code represents the implementation of a UIView subclass that behaves like a custom keyboard key. The key’s accessibility label changes depending on whether the instance represents a letter or other type of character, and on whether a shift key is currently selected. The key also returns different accessibility traits, depending on what type of keyboard key it represents and whether it is currently selected. Note that the code in Listing 2-4 assumes that there are a number of methods that query the state of the keyboard. Sometimes your application displays data that’s not automatically compatible with the way accessibility works. For example, if you display an image, you should provide a description of it in its accessibility label so that VoiceOver users can understand the information the image conveys. Or, if you provide information in a graphical way, such as a rating system that displays stars, you should make sure the accessibility label conveys the meaning behind the graphical representation. The following code snippet uses the example of a custom view that draws the number of stars that corresponds to the rating of an item. The code shows how this view returns an appropriate accessibility label, depending on how many stars it draws. ratingString = NSLocalizedString(@"rating.singular.label", nil); // here, ratingString is "star"
ratingString = NSLocalizedString(@"rating.plural.label", nil); // here, ratingString is "stars"